> How to deal with racist people? Can there ever be a ‘correct’ response for dealing with racist people? I’ve collected answers from real people, dos and don’ts they would recommend. Introduce the term ‘racism’ and its flavours. 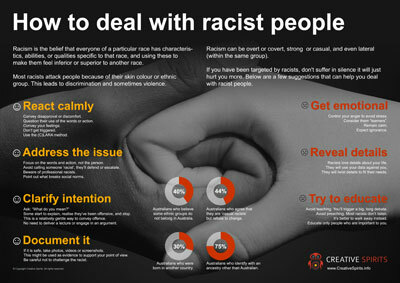 Discuss things you can and shouldn’t do when facing racist interaction. Examine statistics about Australian people’s heritage and racist attitudes. Why not use a classroom exercise to try them out? Get this high-visibility infographic as a high-resolution PDF ready to be printed in A4 or A3.